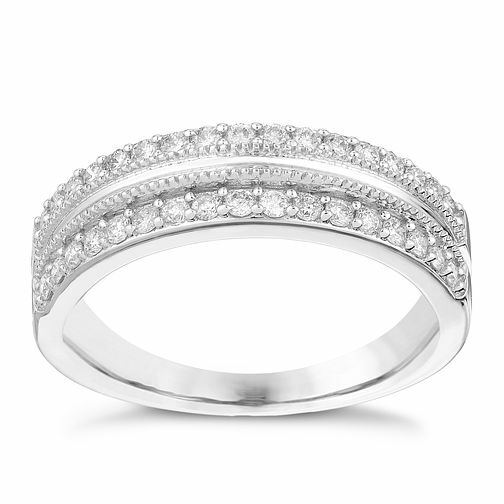 Go for a glamorous look with this stunning diamond eternity ring. Crafted from gleaming 9ct white gold, this elegant eternity ring is set with two rows of dazzling diamonds along its edges that total one third of a carat of diamond, and is finished with beaded detailing for a vintage inspired look. 9ct White Gold 1/3 Carat Diamond Eternity Ring is rated 5.0 out of 5 by 3. Rated 5 out of 5 by Anonymous from Excellent ring coupled with excellent service! The ring is dazzling, of high quality and worth every penny!